I consoled myself with a visit to my own front yard, where the tulip magnolia has just begun to bloom. You can tell that things are just beginning to green up around here. The oak trees are making me miserable, so it must be spring. But these buds are just glorious, aren’t they? I received a nifty new knitting bag from our Random House rep. She grabbed it at a sales conference, just for me. See the cute yarn logo? I love it — it stands up, has a zippered pocket inside, and two big pockets on the outside. Guess I can retire the other ratty-looking Random House Freebie bag I’ve been using lately. Someone cannot get enough of it, it seems. She’s given it a going-over more than a few times, and in the middle of the night she snuffles and scratches at it. What’s that all about? Does she have a thing for fresh nylon or something? Thank you for the birthday wishes! I’m trying to stay in a festive and celebratory mood, but it’s not easy in a busy work week. I’m taking a vacation day on Friday, though, so I might get in a bit of yarn shopping (Treats for me! Treats for me!). Judy and the R’s and the rest of their family are making my b’day dinner, the sweeties. I think I’d like yellow flowers on the cake, girls. Happy birthday! What a good rep you have! 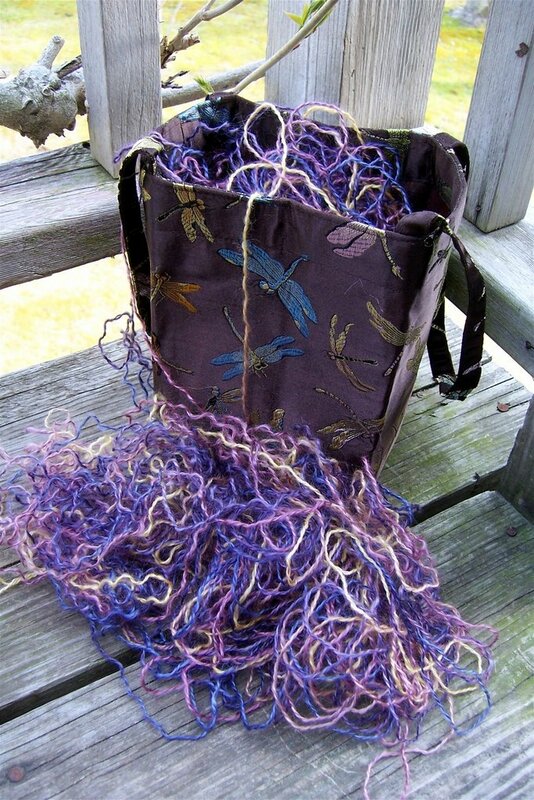 Sounds like the ripping of said skein was a grand idea. There is always something sooo empowering about the freedom to pull out some knitting. What a fabulous hobby we have eh? (I just did some major ripping myself! 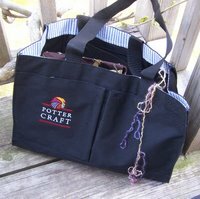 )Happy continued birthday celebration – and GREAT new bag! 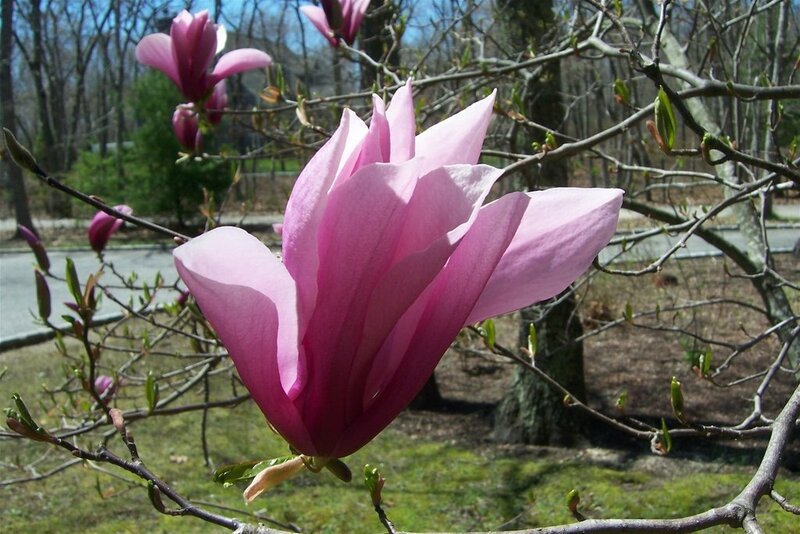 What a great pic of your tulip magnolia – ah, spring! 🙂 Enjoy your yarn shopping! Someone could do a whole blog based on “deconstructing” projects that didn’t work. There was an artist (blanking on the name) who did a whole series in which he erased drawings. DeKooning even did a special drawing for this guy to erase. I like it.Love the idea of taking a trip to your front yard – beautiful pics of the buds, thank you. 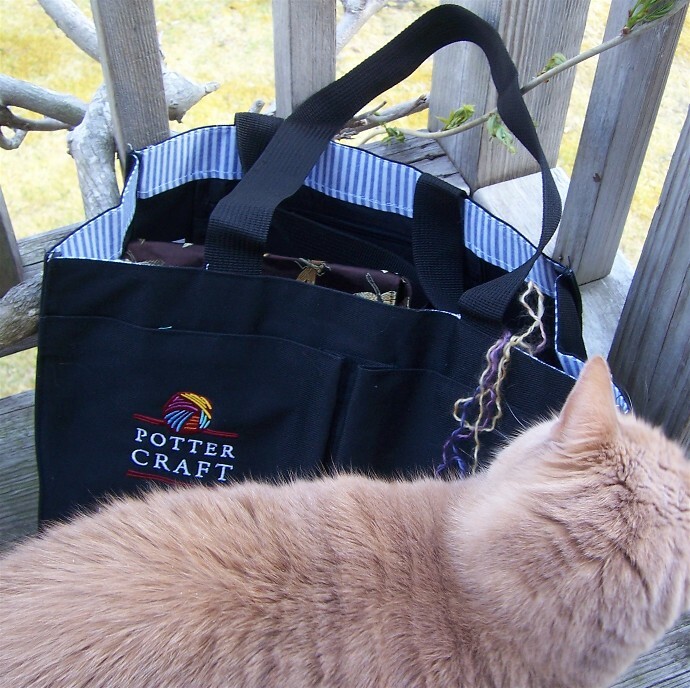 Wow that is a great project bag – and she nabbed it especially for you, even better.